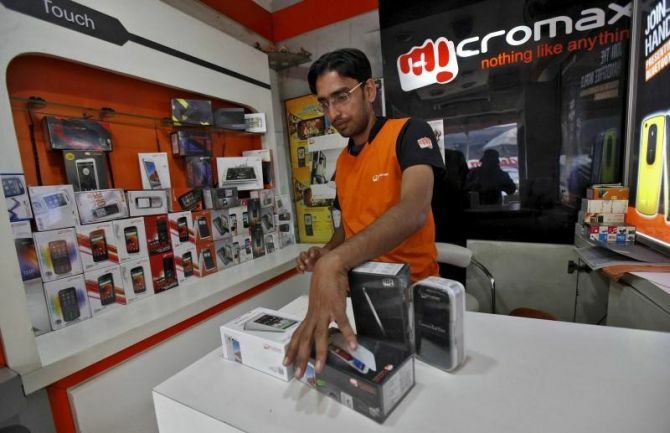 Smartphone handset manufacturer Micromax has made a comeback. After almost drowning in the rising tide of Chinese handset makers in the past two years, the Gurugram-headquartered company regained a slot among the top five in smartphone brands during the September quarter, says analyst firm Counterpoint Research. During the June-September period, it managed nine per cent of all smartphone despatches in the country, at fourth spot, pushing Chinese player Oppo a notch behind. Its comeback in the top-five league occurred exactly after two years. In the September 2016 quarter, it held the second position with 10 per cent market share, behind Samsung. However, analysts think this could be short-lived. For, the rise has been buoyed on the coming legislative assembly election in Chhattisgarh, where the state government has a plan to distribute five million handsets to women and students. Micromax and Reliance Jio have got the supply contract. Once this contract ends, shipments might fall again. In the previous 11 quarters, Micromax's sales dwindled as Chinese handset brands rocked the India market with competitive pricing and a marketing blitzkrieg. Xiaomi rose to the top, replacing longstanding market leader Samsung; Vivo and Oppo together, cornered over 15 per cent. Thus, taking the market share held by Chinese entities to over half the smartphone market. Micromax's remained at five per cent during the period. Loss of sales took place with resignations at the top. Chairman Sanjay Kapoor, erstwhile managing director (MD) of Airtel, quit the company in late 2015. Followed by Vineet Taneja, then the MD, who left after a disagreement with Micromax's co-founders over the firm's valuation, sources said. Calls and messages to two of its co-founders, Rahul Sharma and Rajesh Agarwal, were not unanswered. In fact, revenue fell after 2014-15, when it was an all-time high of Rs 10,450 crore. That in 2016-17 was 46 per cent lower, at Rs 5,610 crore. To strengthen its business, Micromax diversified into other consumer electronics categories -- flat panel televisions, air conditioners and washing machines. Data from Counterpoint also show that after making a brief comeback into the top slot, Samsung has again slipped to the second spot. Xiaomi leads the market with 27 per cent share; Samsung has 23 per cent. Vivo has 10 per cent and Oppo is fifth with eight per cent. Total shipment of smartphones during July-September rose five per cent from a year before. Four of the top five - Xiaomi, Samsung, Vivo and Oppo - reported record shipment, in anticipation of better sales during the festive season. Karn Chauhan, research analyst, says: "India shipment surpassed those of the USA during the quarter, the second time this has occurred." Realme became the first smartphone brand to hit a million shipments within five months of launch across online channels.